Theoretical Coverage: Sq. Feet/Gallon: 497 Sq. Feet at one mil dry. 165-248 Sq. Feet at recommended dry film thickness. Calculated for mixed base and converter, reduced 25%. Actual coverage will vary according to equipment choice, application techniques, part size, and environment. 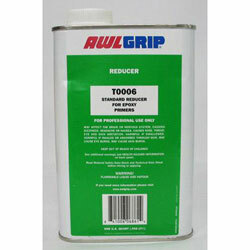 T0006 is a primer reducer, a standard epoxy reducer for spray application of 545 Primer, Awl-Quik, sprayable fairing compound, 30-y-94, and high build epoxy primer. Also recommended for Primer. Recommended Wet Film Thickness: 7-10 mils (175-250 microns) 2 to 3coats. Recommended Dry Film Thickness: 2-3 mils (50-75 microns). Recoatability: At 77°F/50% R.H. Spray: minimum with itself 1 hour, with other products 12 hours. Brush Roll: with itself 12 - 14 hours, with other products 12 - 14 hours. Maximum without sanding 24 hours. Sanding is recommended to improve adhesion and appearance. Overcoat ;/AWLCRAFT® 2000 Topcoats, HIGH BUILD Epoxy ; Sanding Surfacer, ULTRA-BUILD® Primer, HULL-GARD® E.R., and HULL-GARD® W.B.